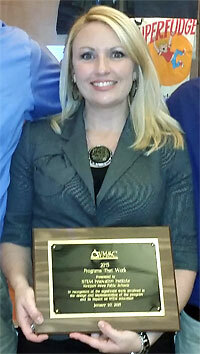 (01/23/2015) -Newport News Public Schools earned a 2015 Programs That Work Award from the Virginia Mathematics and Science Coalition for its iSTEM Innovation Institute, a series of instructional courses for teachers. Selected as one of 10 programs from across the state to receive the award in recognition of its impact on STEM education, the iSTEM (Instructional Science, Technology, Engineering and Mathematics) Innovation Institute is a series of four classes (one per semester) which build progressively from introducing the foundations of STEM and real-world applications, to STEM instruction across content areas. Tami Byron (pictured right), the school division's National Institute of Aerospace Educator in Residence and STEM Specialist, developed the Institute and leads the courses. Nearly 50 teachers are participating in the Institute this year. She was presented with a 2015 Programs that Work Award from the Virginia Mathematics and Science Coalition for the NNPS iSTEM Innovation Institute. STEM education is key to a prosperous community and quality careers for upcoming generations. Newport News Public Schools has embarked on an aggressive STEM education initiative that prepares teachers and students to take full advantage of local STEM opportunities. NNPS is uniquely designed to benefit from the high concentration of STEM-related careers in the region. The Virginia Mathematics and Science Coalition's Programs That Work awards recognize exemplary STEM programs which have a positive impact on student or teacher learning. Award recipients were recognized during an open house and a special awards reception held at the Library of Virginia in Richmond on Tuesday, January 20, 2015.